TABLE FOR TWO Hong Kong: Local Buzz: Dr. James Costello, of Stephen James Luxury Organics talks Quantum calories on HuffPost! Local Buzz: Dr. James Costello, of Stephen James Luxury Organics talks Quantum calories on HuffPost! When we chat with friends about food and drink, the word "calorie" inevitably works its way into the conversation. The calorie these days seems more concrete and real than ever before, commanding respect and fear. We talk about it as if it were some kind of a discreet entity, a thing. But what is a calorie anyway? The term was first coined by 18th century French chemist Antoine-Laurent de Lavoisier to describe the mechanics of a temperature equation. He used calorie as a measure of the heat required to raise 1cc of water 1 degree centigrade. Shortly afterwards the concept was adapted as a model for human metabolism, which we're still using today. The problem is that the model has not much to do with what actually happens as food is metabolized in our bodies. The 17th and 18th Centuries are noted for establishing science's "Mechanistic-Materialistic Model" of the way science then saw things work. Though we may accept that Lavoisier's concept was a pretty good realization for the late 18th century, we might suspect that enough has occurred in the ensuing 230 years that we may be able to formulate a more sophisticated model today. When Quantum physics was born and developed as a vastly more encompassing science in the 20th Century, all of this should have fallen into place. But though Quantum Theory rocked, and then overturned, our scientific understanding of the universe, applying it to the way stuff works has been slow to manifest. And that's understandable as our still mostly mechanistically-based scientific and medical communities have had a hard time trying to come to terms with it. 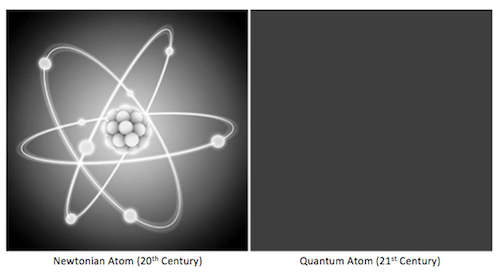 Renowned quantum biologist Dr. Bruce Lipton points out that if we illustrate the differences between Quantum and Mechanistic-Materialistic principles, a picture of a simple atom might look like this. Innovative thinkers like quantum physicist Dr. Amit Goswami have been instrumental in translating quantum physics into everyday language so it is accessible to everyone and can be readily applied to the understanding of our everyday life. Put grossly, the mechanistic concept described a "bottom up causation" model for the way stuff works that begins with elementary particles coming together as atoms, then molecules, compounds, organisms and eventually, us. It worked for Darwin. Quantum understanding basically flips that upside down in what Goswami calls "top down causation." In the Quantum model, consciousness informs everything first, and the Universe springs to life out of delight in itself. It's all about possibilities. You can see why the bulk of the scientific community is still dragging its feet here. But the Quantum Theory has undergone the very soundest of scientific and mathematical testing and is now practically irrefutable. Dr. Goswami says "we cannot even make sense of quantum physics unless we ground it in the primacy of consciousness. Consciousness comes first, it is the ground of all being. Everything else, including matter, is a possibility of consciousness." This has direct bearing on our calorie's relationship to metabolism and food. We all seem to know now that the calorie equivalent of an avocado and a bag of french fries will not produce the same effect on our bodies. If one eats 500 calories of avocado vs 500 calories of french fries, we have the sense that one might be better for us than another. Why is that? Is it only because we have been educated to the problem of "trans-fats" in fries? Magical energy in living food is expressed in things like enzymes which do not exist in french fries. Our food has changed. In Lavoisier's mechanistic model, calories were proposed at a time when virtually all food was "natural and organic," and cooking temperatures were essentially applied around boiling point. Almost all modern processed food has been treated with high temperatures and chemicals to render them mostly inert, so that they might then keep long enough to find their way to our kitchens. In the 21st Century, when the average American consumes 90% of his food as processed, our "calories" are largely being presented to our bodies in a very different form. Economics and city planning have moved most of the world's population to large cities, and created the need to make food sit on shelves for a long time without degrading. But though our minds can be tricked into guzzling "soft drinks" and eating potato chips, our bodies still require the foods of our ancestors to remain healthy. What, exactly, might be wrong with processed foods, that they seem to be making us modern humans fat and sick and tired? What is it that makes food-like substances less good for us than food simply made by sun, earth, air and water? Our bodies have developed channels of receiving and distributing intelligence far beyond our ability to perceive. In our new search for a "Quantum Calorie," we must begin to recognize the difference between intelligent calories and dumbed-down ones. This is highly significant to our model and directly applicable to our current culture's health conundrum. What would be a 21st century "Quantum Calorie"? Discover the answer in Drs. Stephen and James Costello's next Huffington Blog post!